Conor Casey placed the tricolour on the coffin of his best friend, dissident republican John Brady, before three masked men fired shots over the coffin in Strabane, County Tyrone, last October. 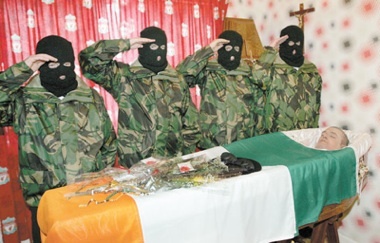 It was reported that the authorities are aiming to prevent republican displays at funerals and events such as Easter commemorations because they are “propaganda” . The PSNI has now adopted a new tactic of charging others present at such commemorations and funerals. It is understood detectives haven’t ruled out arresting and questioning between 50 and 70 other people who were at Brady’s funeral using ‘YouTube’ videos of the funeral as evidence. Two broadcasting corporations have been asked to hand over their footage to detectives. One corporation is reported to have complied while the other is challenging the request. John Brady was found hanging in a police cell in Derry last October. The British authorities claim he killed himself but his family deny this and say his death, which is being investigated by the Police Ombudsman, was highly suspicious. A guard of honour stood over his coffin during Brady’s wake, and on the morning of the funeral, a volley of shots was fired over the coffin as it left the house. Several hundred people attended the funeral. Conor Casey, from Cookstown, last week appeared in court to face charges that he did “aid, abet, counsel or procure” the honour guard on the day of Brady’s funeral. He is denying the charges. Casey’s father, Tommy, a Sinn Fein activist, was shot dead by loyalists as he went to check on a neighbour’s home in 1990. Legal sources said that the last time charges followed a republican funeral was after a hunger-striker’s funeral in 1981. The chairperson of Republican Network for Unit, Danny McBrearty, slammed the jailing of the Tyrone republican on what he said were trumped-up charges. “The imprisonment of Conor Casey at the behest of the RUC/PSNI is a travesty of justice and a clear demonstration of the corrupt nature of the Six County state,” he said. Similar cases which have been thrown out of court after several years legal argument, he pointed out. “The rights of former political prisoners are being subordinated to the destructive interests of the British government, MI5 and its collaborators in the RUC/PSNI. “Conor Casey’s only ‘crime’ was to attend the funeral of his friend, John Brady and to express solidarity with the Brady family. Like his fallen comrade, Conor refused to bend the knee to the British occupation in Ireland. Casey’s plight is similar to that of a number of republicans, mainly former prisoners jailed in the past year on suspicion of engaging in “dissident activity” in the North of Ireland. Republican groups hare campaigned against what they say is the creeping reintroduction of internment without trial. “Justice needs to be served and Conor Casey must be released from prison immediately,” said Mr McBrearty.